Hands bound, necks yoked, three Vietnamese Catholic priests stand surrounded by police, eyes averted, waiting to be photographed (fig. 1). They have just emerged from 33 rue Lagrandière, the central prison of Saigon. After the picture is taken, they embark with their minders onto a waiting steamship. Their destination is the notorious French prison on Poulo Condore, an island off the coast of Cochinchina. During the colonial era, French officials, missionaries, and Vietnamese Catholics lived through changes and conflicts like these that ended European religious and political authority over Vietnamese Catholic life and transformed the place of the Church in Vietnamese society and politics. That is the focus of this study. It demonstrates how French colonial rule allowed for the transformation of Catholic missions in Vietnam into broad and powerful economic and institutional structures in which race defined ecclesiastical and cultural prestige, control of resources, and institutional authority. This, along with colonial rule itself, created a culture of religious life in which relationships between Vietnamese Catholics and European missionaries were less equal and more fractious than ever before. However, the colonial era also created unprecedented ties between Vietnam and the transnational institutions and culture of global Catholicism, as Vatican reforms to create an independent national Church helped Vietnamese Catholics to reimagine and redefine their relationships to both missionary Catholicism and to colonial rule itself. Much like the myriad revolutionary ideologies and struggles in the name of the Vietnamese nation, this revolution in Vietnamese Catholic life was ultimately ambiguous, even contradictory: it established the foundations for an independent national Church in Vietnam, but it also polarized the place of this new Church in postcolonial politics and society and produced deep divisions between Vietnamese Catholics themselves. When the French finally arrested Phan Bội Châu in 1925, they organized a spectacular trial in Hanoi during which prosecutors presented the aging revolutionary's life as a public parable of the immorality and futility of opposition to France's civilizing mission. But in the case of the three priests who had supported Phan Bội Châu, missionaries and colonial officials did their best to downplay, or even hide, the details of the affair to Catholic communities and the broader public; if it had not been for the efforts of a few left-wing newspapers eager to criticize the Church, the affair likely would not have seen the light of day.3 This was because the affair raised troubling questions about French relationships with a Catholic community that missionaries and colonial officials had long thought of, and represented as, loyal subjects. Colonial officials worried that to make an example of the three Đông Dupriests would further strain relations with missionaries and Vietnamese Catholics, many of whom were now critical of colonial rule after a generation of political repression and economic exploitation by an often ardently secular French republican regime. For their part, missionaries knew that the political acts of the priests were inseparable from the tensions that had emerged between European and Vietnamese Catholics over that same generation, when missionary expansion limited Vietnamese autonomy in both the spiritual and worldly aspects of their Church like never before. As such, missionaries worried that making an example of the priests would make them martyrs, dead indictments of the missionary enterprise. Unlike in the case of Phan Bội Châu, the story of the priests had no value as a missionary or colonial morality play. It could only raise questions about the myth of a Catholic community in Vietnam united across races and predisposed by faith to welcome French tutelage. Catholicism's place in Vietnamese society and politics deteriorated rapidly after the unification of the two Vietnamese kingdoms under the Nguyễn prince Nguyễn Phúc Ánh, who in 1802 defeated an uprising led by the Tây Sơn brothers that had overthrown the ruling dynasties in both kingdoms, and established his rule as the Gia Long emperor over all Vietnamese territories. Gia Long remained tolerant of Catholicism, thanks in large part to his growing ties while in exile during the Tây Sơn era to French Catholic bishops, who hoped to create more favorable conditions for Catholicism by supporting the exiled prince. Most famous was Pigneau de Béhaine, who appealed for French military intervention on behalf of the prince, and when it did not arrive rallied his own small army that fought alongside the prince's forces. Despite favorable beginnings, tolerance quickly vanished under Gia Long's successor, Minh Mạng, who sought to transform the new kingdom into a regional imperial power by means of a restructuring and modernization of the imperial bureaucracy, agricultural expansion, military conquests, and a revitalization of the ideological and ritual aspects of Confucian imperial rule. In doing so, Minh Mạng sought to bring a range of groups on the kingdom's geographic and cultural margins, Catholic and other, under greater control during the 1820s and 1830s. Two related but distinct external developments rapidly made Catholicism the primary concern of Minh Mạng and his successors to the Nguyễn throne. The first was the rapid growth of the presence in Vietnam of the Société des Missions Etrangères de Paris, or MEP, in the mid-nineteenth century, a moment of extraordinary growth in global French missionary activity. This expanded the resources and reach of missions precisely when the Nguyễn sought to expand the control of the imperial buraucracy and military over the kingdom's populations. This in turn led many Catholics to resist the challenge that they felt Nguyễn rule posed to their spiritual and social autonomy, which they did through bribery of officials and participation in anti-Nguyễn uprisings. This then led the Nguyễn court to levy increasingly harsher proscriptions against the religion and its adherents. The second external development was the growing presence of the French navy in Asia, which during the 1840s began to exercise gunboat diplomacy regularly to protect French missionaries from growing Nguyễn repression. This only confirmed Nguyễn fears that Catholics were a potential conduit for external influence in Vietnam, and the court's repression of Catholics intensified. During the 1850s, as the rise of British power in Asia and the growth of an industrial economy led the French to consider more direct intervention in the region, missionaries played an important role in convincing the French emperor, Napoleon III, to attack the Nguyễn kingdom in 1858. The war that followed resulted in the French conquest of lower Cochinchina in 1862, France's first foothold in the Nguyễn kingdom. Although official Nguyễn repression of Catholics sharply declined after the conquest of Cochinchina, primarily with the hope of negotiating a retrocession of lost territories, the relations between Catholics and other parts of Vietnamese society largely broke down, leading to a wave of communitarian violence in the years after the conquest. For reasons ranging from self-preservation to vengeance, some missionaries and Vietnamese Catholics lent significant support to Francis Garnier's failed invasion of Tonkin in 1873 and 1874, as well as during France's war with the Nguyễn and the Qing Empire in China from 1883 to 1885 that led to French protectorates over Annam and Tonkin, the remainder of the Nguyễn kingdom. During the final collapse of Nguyễn rule in the 1880s, tens of thousands of Catholics died in another terrible wave of communitarian violence. As Christopher Goscha has shown, the expansion of colonial rule created new networks, mobilities, and imaginaries that led more and more Vietnamese to think of and meaningfully experience "Annam," or "Vietnam," as a cultural and material reality.8 One important part of this change was a body of new French historical scholarship, whose Western model of national history helped to form many foundational narratives of "Vietnamese" history. Many Vietnamese were heavily influenced by these ideas, and they also began to conceive of their past in national terms, albeit in different ways and for different ends. Indeed, French rule led to intense introspection among anticolonial intellectuals, who sought historical and cultural explanations to understand and to change the current state of what they increasingly thought of as a nation. Phan Bội Châu, perhaps because of his close ties to Catholics such as Mai Lão Bạng and the Cochinchinese landowner and intellectual Gilbert Trần Tránh Chiếu, was one of the first Vietnamese after the conquest era to question prevailing views of Catholics as culturally separate and procolonial. In his 1905 Viẹt Nam vong quốc sử (History of the loss of Vietnam), Châu did not deny the collaboration of some Vietnamese Catholics with the French, but he blamed it on missionaries for exploiting religion for political ends and on anti-Catholic elements in Vietnam for allowing anti-Catholicism to divide the nation. Châu, in Mark McLeod's words, thus "sought to emphasize those features of the Vietnamese that were more profound than mere religious preferences, such as membership in a unique 'race' (giong noi), the fraternal affection felt by those who shared common origins and upbringing (cung de, cung nuoi), and particularly a common exploitation by French colonialism. "9 Châu's views, of course, were just as political as those of the Nguyễn and the French: his assumption that a Vietnamese nation united by a shared political objective was a historical and cultural fact left no room for the multiple, often bitterly opposed visions of the Vietnamese nation that would emerge during the long, terrible transition from colonial rule. Modern historiography on Vietnamese Catholicism, written in the shadow of the highly politicized role of the Catholic Church during the wars of decolonization in Vietnam, has done little to complicate this nation-centered binary of exclusion and inclusion. During the First Indochina War from 1946 to 1954, the enthusiasm of Vietnamese Catholics for independence evolved into widespread opposition to the communist-led movement at the head of both the revolutionary regime of the Democratic Republic of Vietnam (DRV) in Tonkin and Annam and the anti-French resistance in Cochinchina. After the defeat of the French and the great power partition of Vietnam at the Geneva Conference in 1954, about two-thirds of northern Vietnam's roughly eight hundred thousand Catholics left the heartland of Vietnamese Catholicism for the southern Republic of Vietnam (RVN) in a mass exodus that came to be known as the Northern Migration (Bắc di cư). Those who remained in the DRV experienced regular, often severe restrictions and repression from the communist state. During the Second Indochina War, or the "Vietnam War," from 1954 to 1975, many Catholics strongly supported southern regimes, most notably that of Ngô Đình Diệm, the first president of the RVN and part of an illustrious Catholic family. The relationship between Catholics and the state was tense after the communist victory in 1975 and remains so today, thanks to issues such as Vatican diplomacy, émigré politics, parochial education, and land rights. Modern Vietnamese-language historiography, especially on politically charged subjects, has long borne the weighty imprint of the legitimating narratives and priorities of the communist party-state. As Patricia Pelley argues about the ongoing project of imagining and consolidating an acceptable and useful vision of national history, "representations of the national past had to correspond with the political and intellectual exigencies of postrevolutionary and postcolonial times, and these were constantly in flux. "11 Because of this, Vietnamese historians have had difficulties in their treatment of many historical subjects: national origins, "Chinese" legacies, ethnic minorities, popular culture, and regionalism, among others. However, their treatment of Catholics is particularly Janus-faced. On one hand, the political need to claim that all parts of Vietnamese society supported the communist revolution has produced a historiographical imperative to find evidence of Phan Bội Châu's claim of Catholic national belonging. This not only has led canonical Marxist historians such as Trần Văn Giàu and Trần Huy Liệu to sidestep subjects like the role of the Church during the French conquest, the Bắc di cư, and Catholic anticommunism, but it has also meant a regular effort since 1945 to valorize politically laudable Catholics such as the Đông Du priests, often described as the "three patriot priests" (ba vị linh mục yêu nước) in modern Vietnamese-language historiography. Since the 1990s, changing conditions for research have produced a body of scholarship that has begun to move the historiography on Vietnamese Catholicism away from past polemics. One major reason for this was the opening in the early 1990s of the archives of the Société des Missions Etrangères de Paris to scholars outside the Church. Combining MEP archives with dynastic chronicles and a range of early modern materials, scholars such as Nola Cooke, Alain Forest, and Nhung Tuyet Tran have written the first nonconfessional social and cultural histories of Vietnamese Catholicism before the nineteenth century, and Laurent Burel and Jacob Ramsay have begun to meaningfully explore the relations between the Church, the Nguyễn state, and Vietnamese society in the nineteenth century.15 In Vietnam, during the ongoing emergence of the discrete conceptual and methodological field of religious studies (tôn giáo học), embodied by the founding of the journal Nghiên Cứu Tôn Giáo (Religious research) in 1999, Nguyễn Quang Hưng has led a more tempered reevaluation of the nineteenth century, and Nguyễn Hồng Dương has written the first serious social and economic studies of Catholic village life.16 James P. Daughton has recently shown how metropolitan Church-state conflicts made relationships between missionaries and colonial officials complex and often antagonistic.17 Finally, important recent studies by Claire Trần Thị Liên and Peter Hansen explore the range of contexts, from political to theological, that shaped Vietnamese Catholic experience during the First Indochina War and the Bắc di cư.18 However, there remains no comprehensive study of what is arguably the most critical question in the modern history of Vietnamese Catholicism: the transition from missionary authority to an independent national Church, which paralleled the rise and fall of colonial rule, and the cultural and political nature and consequences of this transformation. In many ways, the life stories of the Đông Dupriests parallel how this work approaches its subject. Đồng, Tường, and Lĩnh, who were born between 1852 and 1870, grew up in a time of transformation and upheaval in Vietnamese Catholic life. From the 1850s until the 1880s, the missionary presence in Vietnam roughly tripled. From the 1880s until their arrest in 1909, it roughly tripled again. The expansion of missionary authority in Vietnam had great consequences for Vietnamese Catholics and their place in society. As youths, the priests experienced violence, displacement, and the destruction of Catholic communities at the hands of Nguyễn officials and non-Catholics, which led some of their coreligionists to support French military campaigns against Nguyễn authority. The second half of their lives before their arrest was equally transformative, as the rise of French colonial rule allowed for an influx of manpower and resources to help rebuild and extend Catholic missions. Although the extension and consolidation of French rule did offer Catholics some opportunities, whether by facilitating or directly supporting a rebuilding of religious life or giving Catholics positions in the nascent colonial regime, ordinary Catholics, most of whom had nothing to do with the rise of French rule, paid a heavy price for the ties between missions and colonial authorities. Chapter 1 begins with an overview of Catholic religious and social structures in the precolonial era and then explores the nature of mission expansion, which began in the mid-nineteenth century and continued throughout the colonial era. It ends with an exploration of the relationship between Catholic missions, the rise of French colonial rule, and the changing place of Catholicism in Vietnamese politics and society during the nineteenth century. On the surface, the lives of Đồng, Tường, and Lĩnh in the early colonial era were much better than they had been before. In addition to benefiting from greater physical safety, they studied in better seminaries than had the previous generation of Vietnamese priests. Meanwhile, the children they ministered to had greater access to catechism and lay education, and many new churches were springing up around them. But not all was well in their religious community on the eve of their decision to join an anti-French movement. Problems started with the bishop, whose inability to manage personnel and money led him to move clergy arbitrarily from place to place, to assign multiple clergy to the same congregations, leaving others unstaffed, and to calculate budgets so poorly that seminaries ran out of money to buy food one month into the term, forcing the mission to sell valuable land to make up the deficit. The behavior of some missionaries was also scandalous. One reportedly took a wife and had children (and not only with his wife), which was a source of great amusement to non-Catholics, who poked their heads into the church when he baptized babies to comment that the babies looked like him. Many of the priests' parishioners complained about being under the authority of a missionary of such dubious moral character.23 Yet they, and the priests themselves, were now more firmly under missionary authority than ever before. While the three priests all held important positions, missionaries determined their duties and access to resources, just as they by and large controlled the mission's budgets and relations with political authorities. The priests also lived in a religious community in which most missionaries now lived and ate apart from the local clergy, and in which racial difference shaped the most basic aspects of daily life. And the relationship of missions with both the colonial state and local society remained difficult. The rise of political anticlericalism in France during the 1880s intensified conflicts over the disparate agendas of Church and state in the colony, while the many long-standing patterns of communitarian conflict in local society did not disappear with colonial rule. These changes are the focus of chapter 2, which is organized around three ongoing sources of conflict in Catholic life during the early colonial era: communitarian relations, tensions between Catholic missions and the colonial state, and fraying relations in Catholic life itself. For colonial officials and missionaries both, the involvement of Đồng, Tường, and Lĩnh in revolutionary activities embodied the critical state of many Catholic missions at the turn of the century. The three priests were not, in fact, outliers: many other priests in Nghệ An and nearby provinces were also linked to Phan Bội Châu, and missionaries reported widespread support for the three priests among ordinary Catholics.24 The opposition of some Vietnamese Catholics to political authority was not a new phenomenon, but during the colonial era many came to evince equally great opposition to missionaries themselves, and they began to appeal to the Vatican to address their myriad criticisms of European religious authority. On April 1, 1910, a group of Catholic notables from Nghệ An wrote directly to Pope Pius X bemoaning the "bad spirit" of many missionaries and the "scandalous discord" in the mission, especially the decision of a few missionaries to turn in Đồng, Tường, and Lĩnh, "for us an enormous dishonor and an immense tragedy for the faith. "25 The growing links between Vietnamese Catholic life and Rome are the subject of chapter 3, which focuses on the consequences in Vietnam of a global campaign during the 1920s and 1930s to lay foundations for independent national Churches across European colonial empires. Rome's reforms aimed to form a better-educated and more self-sufficient clergy and laity in non-European Churches in order to forge closer, more direct ties between these Churches and the Vatican. These reforms were a response both to an ebbing missionary presence, which had been dealt a severe blow by the First World War and changing European religiosity, as well as to tensions between local Catholics, missionaries, and colonial authorities that plagued Catholic missions in Vietnam and throughout the world. By the 1930s in Vietnam, Rome's reforms had laid the foundations for an independent Church and contributed to the growth of a new culture in Catholic life that was as exhilarating for Vietnamese Catholics as it was threatening for missionaries and colonial officials. Đồng and Lĩnh were released from Poulo Condore in 1918 as part of an amnesty to honor Vietnam's sacrifices for France during the First World War. However, they were forbidden to return to Nghệ An and were instead sent to Saigon, where they served as parish priests. There they encountered what was, in many respects, a different country, a place where Catholics spoke a virtually unintelligible Vietnamese and practiced their faith in very different ways. However, what was an exile for Đồng and Lĩnh was, by the interwar years, an increasingly central part of Vietnamese Catholic experience. Indeed, the Vatican's reforms to create the infrastructure for a national Church, as well as the economic, administrative, and cultural transformations of French rule, helped to create new and powerful connections not only between Catholics from different parts of Vietnam but also between Vietnamese Catholics and the global Catholic world. However, the emerging experience of a national religious community did not make relationships between Catholics and other parts of Vietnamese society less complex; powerful communitarian identity and new ties to global Church networks often reinforced boundaries, real and imagined, between Catholics and others. These changes are the focus of chapters 4 and 5. Chapter 4 explores how the emergence of a system to write spoken Vietnamese by means of the Western alphabet (quốc ngữ) made the printed word a part of mass Catholic experience and changed Catholic understandings of self and society. Chapter 5 examines how experiences such as migration, economic change, urbanization, pilgrimage, and festivals made the "imagined" religious community an increasingly tangible and central part of Vietnamese Catholic life. The memory of the Đông Dupriests did not disappear, despite the best efforts of Church officials and French authorities. Missionaries arriving in Nghệ An in the 1930s reported that the story was an important part of local Catholic memory at a moment when the Great Depression and growing colonial repression were bringing more Vietnamese away from reform and toward resistance. Of the three priests, only Nguyễn Thần Đồng ever returned to Nghệ An. It was in 1944, in the midst of war and famine, and he was an old man with his revolutionary past well behind him. But his native village of Nhân Hòa had not forgotten him, and villagers held huge celebrations to honor his return. Present to welcome Đồng was Nguyễn Bá Tòng, whom Đồng had known in Saigon, and whose ordination as the first Vietnamese bishop in 1933 was an enormous symbolic turn away from missionary authority.26 Tòng's presence at Đồng's homecoming celebration embodies the close ties between religious reforms and the nationalist sentiment that had emerged in Catholic life in the generation since Đồng's arrest and exile. Indeed, the emergence of a national Church also helped to make Vietnamese Catholics enthusiastic about the idea of an independent nation, and during the interwar years it brought them into global Catholic politics in a way that would shape their perspectives and choices in the revolutionary era. The strong link between religion and new political identities, however, also brought Catholics into conflict with visions of Vietnamese nationalism that continued to see Catholicism as a cultural or political outlier, or even an opponent. Chapter 6 explores how Vietnamese Catholics came to understand and debate the idea of nationalism, how new essentialist ideas about "national culture" made religion a source of conflict in debates about Vietnamese nationalism, and how the rise of Social Catholicism and anticommunism shaped the relationship of Vietnamese Catholics to emerging revolutionary politics. Nguyễn Thần Đồng died just two months after his return to Nghệ An, nine months before Hồ Chí Minh's proclamation of independence on September 2, 1945, realized the ambitions of the movement he had joined decades earlier. Chapter 7 examines the place of the Catholic Church in Vietnam's transition from colony to separate and opposing nationhoods. The First Indochina War, fought from 1946 until 1954 between the French and varying Vietnamese political factions, hastened the pace of Vatican institutional reforms, as the break from colonial rule led to a rapid extension of the Vietnamese Church hierarchy and a transfer of most Church institutions entirely to Vietnamese direction. As full-scale war erupted, new print organs and associational networks became crucial for circulating information and opinions as well as for Catholic community defense and mobilization. And as the broad but tenuous nationalist consensus fragmented, religion came to play a greater role in the political choices of Vietnamese Catholics: the Vatican's role in Catholic life strengthened anticommunist voices and supported the activities of Catholics such as the Ngô family, while left-wing Catholic ideas kept many Catholics in resistance networks even as Vietnamese communists cemented their ties to the global communist bloc. The end of this study, the 1954 partition of Vietnam and the Bắc di cư, marks a new era in Vietnamese Catholic history, when a newly independent Church now confronted the challenges of mass migration, civil war, reunification, and relations with communist authorities as it sought to shape its postcolonial future. In his study of narratives of Chinese national history, Prasenjit Duara observes, "national history secures for the contested and contingent nation the false unity of a self-same, national subject evolving through time.... It allows the nation-state to see itself as a unique form of community which finds its place in the oppositions between tradition and modernity, hierarchy and equality, empire and nation. "27 However, Duara argues that although all national narratives by necessity "appropriate dispersed histories according to present needs," the act of appropriation inevitably becomes a source of their tensions and shortfalls.28 In other words, the claims of other, competing histories never disappear but instead reemerge during historical or historiographical transitions. This study is written more than a generation after the end of the Second Indochina War, at a time when the turn toward a market economy, the tensions of one-party rule, widespread and rapid social mobility, religious revival, and other forces are pushing the revolutionary era further into Vietnam's past. Accordingly, the field of Vietnamese studies is turning away from the powerful national narrative of Vietnamese history and instead treating the nation as-to use Duara's words-"the site where different representations of the nation contest and negotiate with each other. "29 Few subjects have as much potential to contribute to this project as Vietnamese Catholic history, and doing so was certainly my intention. However, I hope and believe that this effort to write a more meaningful history of Catholicism in modern Vietnam has not resulted in a Catholic narrative of Vietnamese national history. If anything, I hope that the portrait of change and conflict in Catholicism in Vietnam that emerges in these pages serves to provincialize the "nation" as a category of analysis in the writing of Vietnamese history. This work rests on three main bodies of sources. The records of the French colonial and protectorate administrations in Vietnam, held in Aix-en-Provence, Hanoi, and Ho Chi Minh City, include documentation that ranges from the Ministry of Colonies to municipal administrations. Despite its well-known limitations, this material sheds light on a wide range of issues: Church-state relations; the economic, legal, and political standing of Catholic missions; Catholic schools, institutions of social welfare, and associations; communitarian relations; surveillance of Catholic individuals, groups, and press organs; and others. The French Foreign Ministry archives in Paris reveal the details of the deeply contentious relationship between French colonial officials and the Vatican surrounding Church reforms in the interwar era. Although scholars have made good use of French colonial documentation to study the Church's role in the conquest, early French rule in Cochinchina, and Church-state relations before the First World War, the bulk of these materials in this study are cited for the first time. The second body of sources, Church documentation, primarily includes the records of the Société des Missions Etrangères de Paris and of the Vatican's mission organ, the Congregation for the Evangelization of Peoples, as well as those of smaller Catholic orders. As scholars have begun to demonstrate for the early modern era, MEP documents, primarily letters from bishops and missionaries as well as annual reports from individual missions, are an invaluable source for the social and religious history of Catholicism in Vietnam, especially the organization of local mission life as well as relations between Vietnamese Catholics and missionaries. Only one other scholar, the Catholic historian Etienne Võ Đức Hạnh, has made systematic use of MEP materials for the colonial era, and he has done so only up to 1903. Missionary documentation on particular incidents or local affairs is often by a single author, unlike French colonial records, which typically include perspectives and testimonials from multiple layers of the French administration, from Vietnamese officials, from missionaries, and sometimes even from Vietnamese Catholics, all in the same dossier. The limits of MEP materials make Vatican documents, again used almost entirely for the first time here, all the more invaluable. Propaganda Fide's archives include detailed records of mission finances; reports of Vatican envoys; documents from the Apostolic Delegation in Indochina, the Vatican's first direct representative in Vietnam; and, most importantly, scores of letters from Vietnamese Catholics to officials in Rome and even to the pope about the difficult conditions in their missions, their poor relations with missionaries, and their aspirations for an independent Church. The third and perhaps most valuable set of sources for this study is the extensive and almost wholly unexplored body of Catholic religious bulletins, journals, newspapers, and pamphlet literature in quốc ngữ, written mostly during the 1920s and 1930s. Despite Alexander Woodside's 1976 call for scholars to explore the "archival treasurehouse of Vietnamese journalism," I still had to cut open the pages of many newspapers and pamphlets when I read them in the Vietnamese National Library for the first time since these copies were deposited when the library's collections were still the colonial dépôt légal.30 These materials include theological, liturgical, and paraliturgical texts; writings on Catholic morality and ethics; Church histories; popular religious fiction in the form of novels, stories, poems, and plays; journalistic accounts of issues, events, or individuals; school primers and pedagogical manuals; and many other documents, again largely used for the first time here. This study also makes significant use of historical studies by Vietnamese Catholics both inside and outside Vietnam, many of them published locally and unconsidered in Western scholarship. Several terms for Catholic officials and administrative designations require explanation. The smallest unit of Vietnamese Catholic life, họ, best translated in English as "subparish," is usually translated as "congrégation" in French. I use "congregation" here despite the important differences between this form of community and the one usually associated with the English term. The formal term for a Catholic mission was a vicariate (vicariat) and not a diocese (diocèse) or bishopric (évêché), giáo phận or địa phận in Vietnamese; the latter two refer to an ecclesiastical territory that, unlike a vicariate, is formally integrated into the Church hierarchy. Similarly, the head of a mission was an apostolic vicar (vicaire apostolique) and not a bishop (évêque, giám mục). However, French and Vietnamese sources most commonly use the terms "diocese" and "bishop." In hopes of clarity and consistency, I use the term "mission" and will refer to their heads as "bishops." Beginning in 1924, missions were formally designated by the name of the mission seat instead of by their French name (for example, Saigon and not Cochinchine Occidentale). Because the mission seat more clearly situates these territories geographically, I refer to missions as such for the entire colonial era within the text, although I preserve the original titles of documents in citations. Vietnamese Catholics virtually always took a Christian name, but many of the documents I came across do not include them. For this reason I have decided to omit Christian names altogether, even (and with apologies) if most of the people who are the focus of this study would probably have preferred otherwise. I also omit diacritics if they are unknown to me. I render into English the names of places that are well known to English readers (Hanoi, Saigon, etc.) and use diacritics when possible for other geographic references. Unless noted otherwise, translations are my own. Those who study this place and time face vexing problems of nomenclature. The modern nation-state of Vietnam did not exist before 1945, so my use of this word is usually anachronistic. I use it anyway because, in my mind, the alternativesall pose greater problems. "Indochina" included the French protectorates of Cambodia and Laos, neither of which is a focus of this study. I avoid "Annam," the most common collective term for the three Vietnamese parts of Indochina during the colonial era, for sever al reasons. First, there was never a single state named "Annam" that governed the territories of modern-day Vietnam; there were critical differences between the discrete regimes that governed the northern region of Tonkin, the southern region of Cochinchina, and the central region of Annam (the use of this term at the time to refer to both the central region and all three regions is another point of confusion). Although "Annam" was certainly a powerful cultural idea during the colonial era, it never held the normative legal status that would oblige the use of the term in a historical study. Moreover, not only was "Annam" considered pejorative by some, but many Vietnamese during the colonial period simply did not identify as part of a community that spanned contemporary Vietnam's borders. In short, the problem is to find a term to refer to a bureaucratic regime and cultural identity that, during the colonial era, was in the process of becoming. If we accept that the origins of postcolonial Vietnamese regimes and identities have their roots in the colonial era, we need a language to describe them before 1945, but, precisely because they were contingent and deeply contested, there is no single term that will work in all circumstances. I therefore use the word "Vietnam" simply as shorthand to describe the three Vietnamese regions of French Indochina, and the phrase "Vietnamese Catholics" to indicate the study's focus on those Catholics who identified as or were categorized as ethnic Vietnamese (kinh, itself admittedly a problematic category). In doing so, I do not mean to suggest that the modern nation of Vietnam or the identities that it has generated existed in the same form during the colonial era. 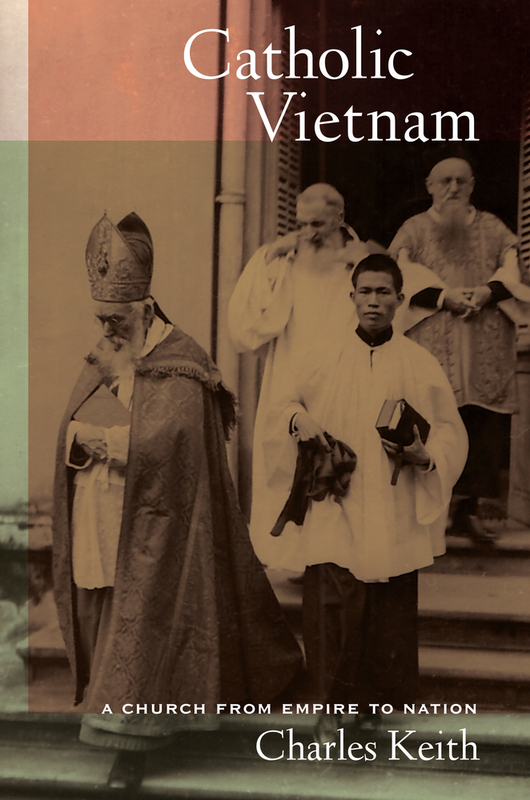 In this important new study, Charles Keith explores the complex position of the Catholic Church in modern Vietnamese history. By demonstrating how French colonial rule allowed for the transformation of Catholic missions in Vietnam into broad and powerful economic and institutional structures, Keith discovers the ways race defined ecclesiastical and cultural prestige and control of resources and institutional authority. This, along with colonial rule itself, created a culture of religious life in which relationships between Vietnamese Catholics and European missionaries were less equal and more fractious than ever before. However, the colonial era also brought unprecedented ties between Vietnam and the transnational institutions and culture of global Catholicism, as Vatican reforms to create an independent national Church helped Vietnamese Catholics to reimagine and redefine their relationships to both missionary Catholicism and to colonial rule itself. Much like the myriad revolutionary ideologies and struggles in the name of the Vietnamese nation, this revolution in Vietnamese Catholic life was ultimately ambiguous, even contradictory: it established the foundations for an independent national Church, but it also polarized the place of the new Church in post-colonial Vietnamese politics and society and produced deep divisions between Vietnamese Catholics themselves. Charles Keith is Assistant Professor of History at Michigan State University.